Grandpa came this weekend to visit. 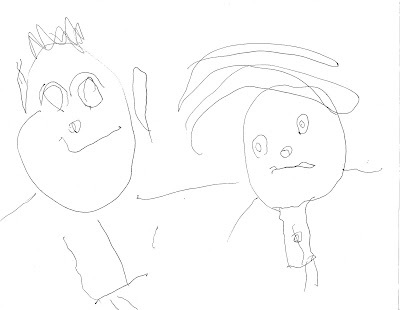 We didn't take too many pictures, but Blondie drew one this morning of them together. Whenever she draws him she says, "Grandpa has crazy hair Mommy!" As you can see she made sure that she has a belly button and grandpa has ears. Apparently arms come out of our heads. We'll have to work on that one, but I think she does pretty well for a 2 year old. BTW, Kent is quite the trooper. He traveled across the California and Arizona desert in his little Honda with no a/c to see us. We always love having him here! I think he read over 50 books to her in 3 days. Holy Cow, she is amazing. Cannon is pretty lucky to get even an "0" onto paper- and it isn't even that good, but don't tell him. Amazing drawing for a 2 and 1/2 year old. Kids go through stages in their drawing and Ava is about two years ahead of herself. All kids have arms coming out of their heads because that is what they are noticing at this stage in their visual development. Hey, who cares, I love the hair!! That really is a great drawing. Cadence continues to draw what we call "Amoebas." She's actually trying to draw kitties which we draw for her all the time but they end up looking like blobby circles with more blobby circles and arbitrary lines dashed through it. Actually maybe she'll grow up to be a scientist and I just put my foot in my mouth.